Charles Carroll Goodwin was an author, editor, poet, lawyer, judge, and businessman. Charles Goodwin was born on April 4, 1832, near Rochester, New York. At the age of 20, he made his way west, where he first settled in Marysville, California. There, he operated a sawmill, taught school, and studied law with his brother Jesse. He was admitted to the bar of California in 1859 and started a law practice in Plumas County. The following year, he moved to Nevada where he was appointed as a Probate Judge for the Territory and when Nevada obtained statehood in 1864, he was elected as one of the first state district judges. In 1863, he became the editor of the Washoe Times in Washoe City, Nevada and would later edit the Inland Empire newspaper in Hamilton, Nevada. In 1872, he ran an unsuccessful campaign for Congress but maintained an active interest in politics, as well as mining. 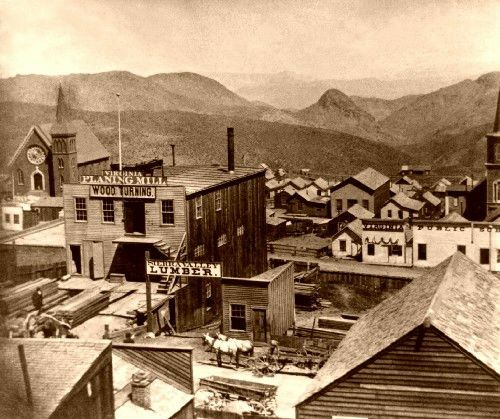 He joined the Virginia City Territorial Enterprise in 1873 as assistant editor and two years later was named chief editor. In 1880, he left Virginia City to take charge of the Salt Lake City Tribune in Utah. There, continued his interest in politics and was a member of the constitutional convention preceding Utah statehood but lost his bid to become a U.S. Senator from the new state in 1896. In 1902, he served as editor for the Goodwin’s Weekly, a magazine founded by his son James. Though best known as a journalist, he also wrote several books, as well as poetry, stories, and essays that appeared in magazines and periodicals. He died in Salt Lake City in 1917.